Great Gifting - mark. Super Color Box! mark. Super Color Box Total Face Palette - $25 - small in size but big in product - the case slides open to reveal 16 eye shadows, 4 lip glosses and 2 blushes along with a built-in mirror and 3 applicators - making it perfect for touch-ups on the go! 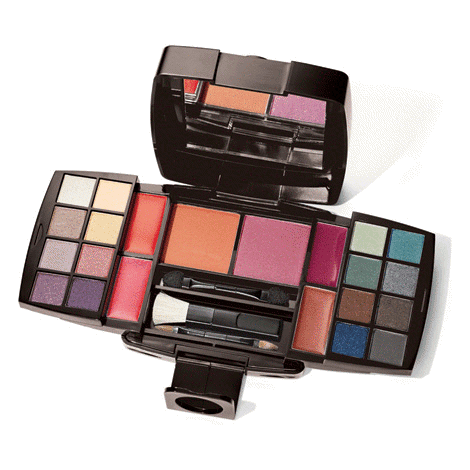 Available from your Avon rep - 1-800-265-AVON or online at www.avon.ca. We're so happy you want to comment! But please, if all you are here to do is promote your own link/contest or spam us - don't bother, your comment will be deleted and we will think evil thoughts about you for the rest of the day! Our site is very picture heavy and thus best viewed using Firefox/High speed internet. Lisamarie - the happiest day of my life was the day Sephora opened it's first store in Canada (thankfully in Toronto), second happiest day was before this when Sephora finally started shipping to Canada, third I guess would be my wedding day (but don't tell my husband where he ranks please!) *** Christelle - I enjoy shoe shopping and drinking martinis...preferably at the same time! Since you have to read this crap you should at least win something for your trouble! What does one do when Google Friend Connect abandons you? Do some BlogLovin' of course! We're everywhere - like bedbugs! Found this site amazing, useful or even mildly entertaining? Then join us on Google + - We're still not sure what it does but all the kids are doing it so it must be good! Subscribe and we'll come right to your house everyday and feed you grapes! Stuff that's obviously nuts because you enjoy reading it! Help is here for damaged hair with John Masters Organics! Spray your way to rose hydration with Korres, Kosmea and Fresh! This week I'm obsessed with... Patchology Resting Beach Face Kit! Yves Rocher Anti-Age Global for the best in natural anti-aging! Happy Holidays from Beauty Crazed! Brow customized just for you with Ritual browWOW! Beauty's in the bag with Sephora, MAC and mark.! This week I'm obsessed with... BootRescue Wipes! Artdeco Glam Stars Lip Gloss - with swatches! Calm down with products from Neutrogena and Avon! Crazy for CC - Pür Mineral CC Cream! The best of Kiehl's is yours for the gifting! Great Gifting - eos Holiday Collection! Holiday nails made easy with Kiss and Avon!